The restaurant supply superstore stocks many different jellies for your breakfast toasting needs and for making pbj's at your restaurant. Our assorted jelly is found throughout the foodservice industry on tabletops and in buffets. Hotels love our top quality jelly for their continental breakfast buffets and lunch and dinner. Top your toast off with high quality jams and jelly. Jelly Assortment Mixed Fruit 10 Grm. Mayo, Dressings and Condiments Strawberry Grape Mixed Fruit Assortment Jelly 0.5 Oz. Kraft Jelly Assorted Fruit - 0.43 Oz. Portion Pac Americana Jelly Flavor - 10 Grm. Portion Pac Americana Jelly Flavor - 0.5 Oz. Portion Pac Flavor Jelly Assorted - 0.5 Oz. 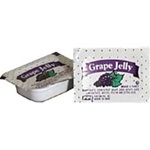 Portion Pac Grape and Mixed Fruit Jelly Flavor - 10 Grm. Portion Pac Jelly Assort Flavor - 10 Grm. Portion Pac Assorted Jelly Flavor - 0.5 Oz. Portion Pac Assorted Jelly Fruit Flavor - 0.5 Oz. Portion Pac Welchs Jelly Assorted 0.5 Oz. Portion Pac Welchs Assorted Jelly 0.5 Oz. Mixed Fruit and Grape Flavor Jelly - 0.5 oz. Jelly Apple Single Serve - 0.5 Oz. Americana Jelly Assorted - 0.5 Oz. Assorted Fruit Spread Portion - 0.5 oz. Jelly Assortment Plastic - 0.5 oz. Jelly Assortment 3 Plastic - 0.5 oz. Sugar Free Assortment Jelly - 0.375 oz. Jelly Assortment 7 Plastic - 0.5 oz. Assortment 17 Plastic Jelly - 0.5 oz. Apple Jelly Plastic - 0.5 oz. Seedless Blackberry Jam Plastic - 0.5 oz. Apple Cinnamon Jelly Plastic - 0.5 oz. Mixed Fruit Jelly Plastic - 0.5 oz. Jelly Assortment - 0.5 oz. Peach Jam Plastic - 0.5 oz. Jelly Assortment 8 Pack Plastic - 0.5 oz. Jelly Assortment 4 Pack Plastic - 0.5 oz. Assorted No.1 Jelly Cup - 0.5 Oz. Flavor Fresh Assorted Jelly 80 Grape 40 Strawberry and 80 Apple - 0.5 Oz. Flavor Fresh Assorted Jelly 80 Grape 40 Strawberry and 80 Mixed Fruit - 0.5 Oz. Buy wholesale Assorted Jelly for your restaurant and food service needs for spreading on toast and making peanut butter and jelly sandwiches. These are also great for making donuts.